Reflecting on the natural environment deepens our connection with our personal nature. At this critical time in our history when the natural environment is under attack from so many quarters, it is obvious that we need to do something positive. Yatoo Nature Art Association has provided me as an artist with an opportunity to create a work that inspires contemplation and reflection. The Korean Black Granite stone suspended above the reflecting pool; is it a sword or a dagger, or is it a leaf turned to stone? Like Damocles in the ancient Greek story are we now the ones in danger, a sword suspended over our heads and liable to fall unless we change our ways? 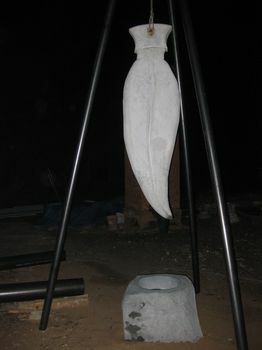 The tripod from which the stone is suspended is over 4.5 metres high. 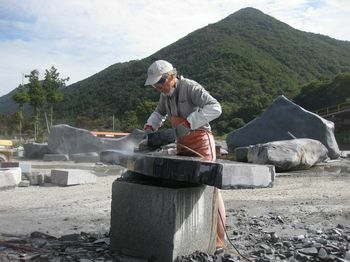 I carved the 1.8 metre Korean Black Granite leaf/sword in 2 days at a stone factory about1 ½ hours from the Yatoo Centre. The Director Mr Ko is pleased to have the work as Many artists will come to the Centre for the Art Biennial.